I live in a little quartier in the 1ere arrondissement, the neighborhood number one, in an area sometimes called St. Vincent, which is the name of the church on the riverside nearby, or sometimes called La Martinière, which is the name of the guy and the name of the halle, the school, and an avenue. There is a geriatric population who quietly peer through crooked shutters in gorgeous belle-epoque buildings and who will pass their apartments to their sockless dock-sider wearing grandsons. Then there is the side that wants to call the neighborhood the lower Pentes de la Croix Rousse, which means in the lower slopes of the hilly neighborhood known for voluminous headscarves, dangly earrings, loft living, budding seamstresses, yoga classes with discount for the unemployed, and a bio market by the metro stop every Saturday. It is a very interesting mix. In a nutshell, my neighborhood is suffering from a severe identity crisis. This can actually be a boon because such diversity breeds creativity - rich territory for good eats, and some great restaurants are really thriving here. If you’re not eating at my house, there are lots to choose from in the restaurants of my neighborhood. 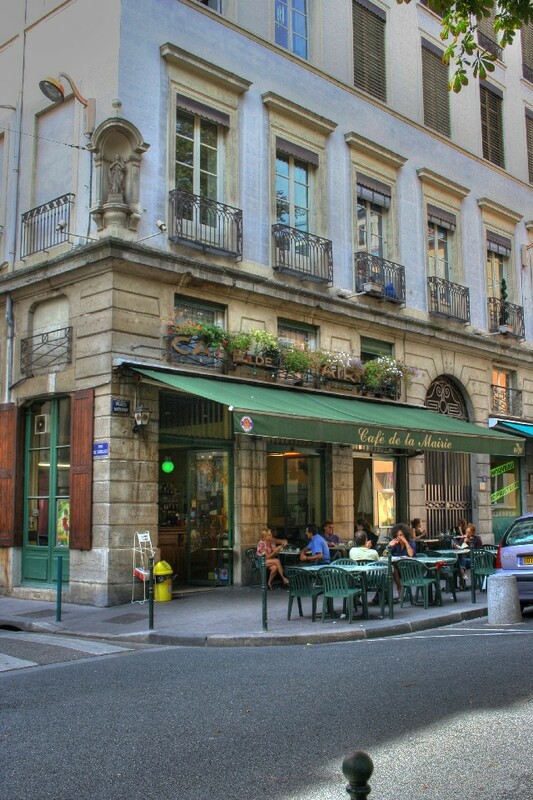 For Apéro: When the weather is good, head directly to Place Sathonay. The Ambiance there can't be beat for a nice relaxed drink on one of the many outdoor café terraces surrounding the square. le Café de la Mairie is the most fashionable and those who know who is who might just be impressed. Otherwise, any of the cafés will do, actually. You’re there to watch the pétanque matches, and just soak in the atmosphere. When it's raining or snowing, meet friends at Voxx, on the corner of quai Pecherie & rue Algerie, where they play 1980s LPs on the record player during the day and in the early evenings. It picks up after about 8. If you’re a non-smoker or looking for an older crowd you might be better off during apéro hour at the Café Bistrot Pêcherie, a block and a half down, which has a better ventilation system, more wood paneling, and the music is a bit less stylized. For dinner, here's the scoop. First of all, there have been some changes in the past few months. News: The previous owner packed up his rubber chickens and the restaurant is now owned and run by chef Franck Delhoum, previously the head chef at Paul Bocuse's Brasserie de l'Ouest. Lets see how he does for 30 covers instead of 300. Sounds promising, yes? Key Words: Petit bistrot de quartier, semi-open kitchen, open Tuesday to Saturday. Formule midi 12€, soir 28€. News: That pizza place near place Sathonay has been replaced by a real restaurant. They tore off the whole front of the place and just built on the rocks. It turned out really pretty. News: Magali & Martin Schmidt own and run the new restaurant which caters in a secretive way to a demanding fashionable clientele. Very chic and mysterious. Key Words: Gorgeous small dining room. 20 covers. Cuisine du Marché. (a bit hard to find, as they have no sign, and are shuttered tight oustide business hours, as if the place is being kept secret. Effectively this draws lots of curiosity and adds to the desirability quotient. Locate the Nardonne ice cream shop and proceed down the alley across the street between the drum shop and the butcher.) Open all week except Saturday and Sunday lunch. Formule midi, 14€, dinner ?? News: Still serving traditional Italian to discriminating palates. Key Words: Traditional (and real) Italian featuring seasonal Italian imports, octopus linguine, carpaccio brésaola, constantly changing antipasti. Just next to the Fresque. If you’ve never been to Italy, eating here might just make you realize what real Italian food tastes like. Open Tuesdays to Saturday, menus 22€ to 25€. Albert: 10 place Fernand Rey, Lyon 1e, 04.78.27.95.56. 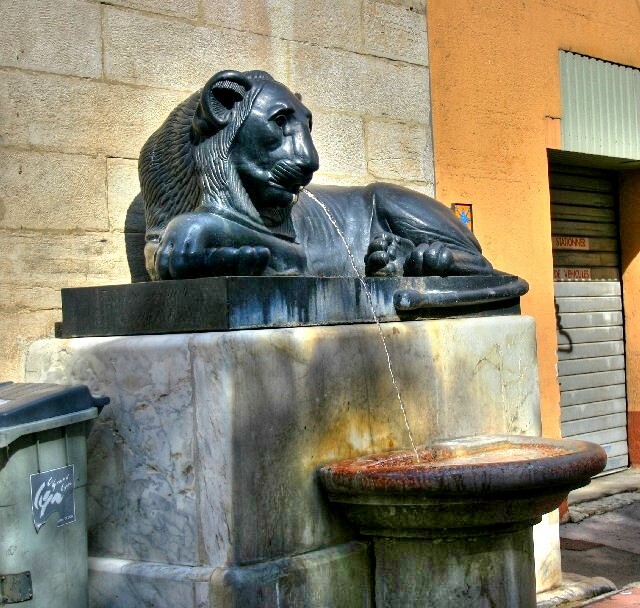 This place is located in the little nook you find when you take the road towards the quai from the Café de la Mairie on Place Sathonay. For good French food, pass by the 'bouchons' and head for Albert. Pretty brocante finds line the walls. It kind of makes you sad for all of the terrine sets they must have destroyed to amass their collection, but once you taste the food everyting is alright. They serve refined traditional French, and very rarely disappoint. Magret de Canard, Carpaccio de bœuf, wine in proper glasses, correct service, a good rapport quality/price. Bottomless terrines at Albert. Boo hoo. A visit to France isn’t complete without trying couscous. Since 1985, first for couscous, the best out of 5 or 6 choices. Make the effort to locate this one. The restaurants on the same street take the spill-off from this one and aren't as good. Open Monday to Saturday. Menu items from 4 to 17€. 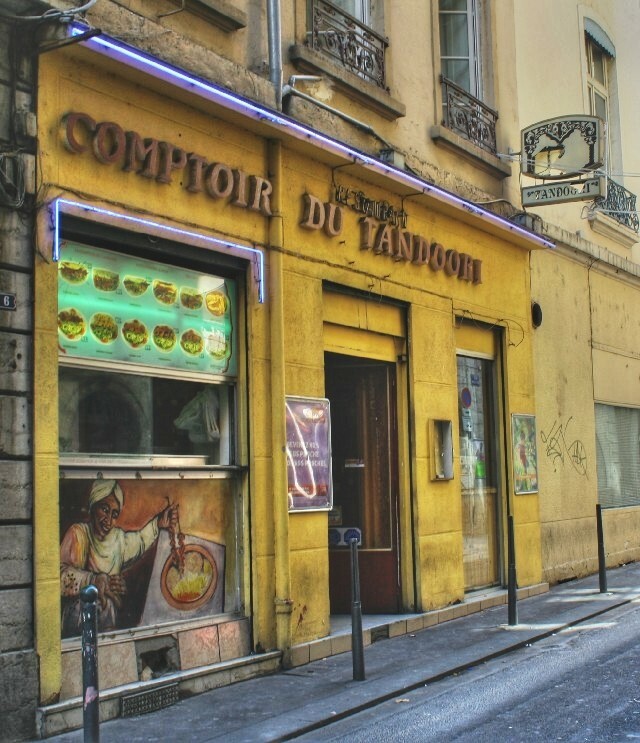 Comptoir du Tandoori, 6 r Ste Catherine, Lyon 1e. 04.78.28.07.48 A serious hole in the wall. They turn out great sandwiches to go for 3.50€. Their plated dishes are ok but I am sending you to this place because of their sandwiches. Gorgeously spiced meats and vegetarian delights wrapped in hot thick freshly traditionally baked nan. Delicious. Better than any of the others on the street. A good picnic is to get sandwiches there to go, and then take them back out across Place des Terreaux (get off rue St. Catherine, quick, before someone asks you for a cigarette! ), and go into the courtyard outside of the Musee des Beaux Artes. Listen to the birds, watch the people, and enjoy this great Indian sandwich. Balmoral. 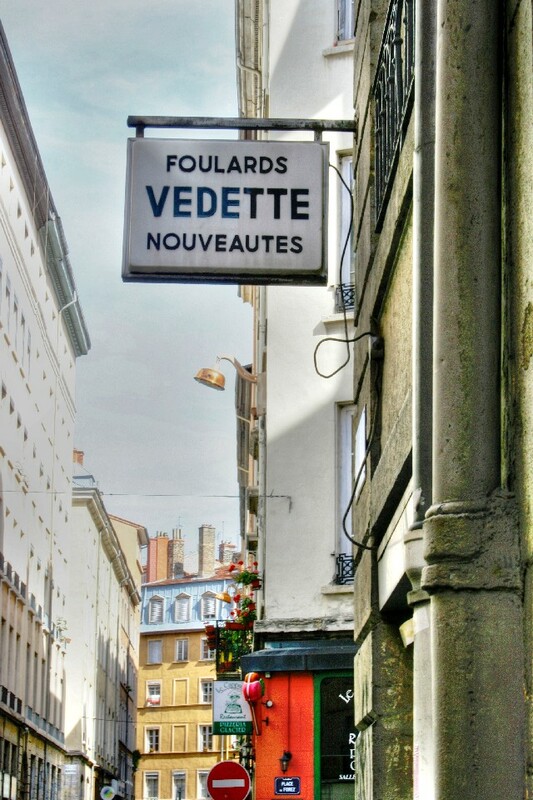 14 rue Lanterne, Lyon 1e, 04 78 28 72 53. Best pizza in the neighborhood. Wood fired stone oven, hand tossed crust by a serious expert. This place was a legend for decades, dark with velvet booths, candles in Chianti bottles, old Italian men playing cards at the back tables, black & white photos of the owner with movie stars and moguls. The old dudes that owned it passed it on to some young 'uns who did something horrible - they painted the place hot flourescent orange and put in Ikea lightbulbs, got some mopeds for delivery, and just messed up all of the food including the pizza. Business plummeted. Within a year, the godfathers took the restaurant back and have changed the lighting, put the original guy back by the wood stove, and got their old customers back but the electric orange paint has yet to be covered up. Don't be fooled. It's the pizza we're there for. They also do an excellent antipasti platter and the veal kidney and house tiramisu are also very good. If you do go for dessert though, you must try the house crème caramel. I think whoever prepares that dish must have sold her soul to the devil. A film crew overtook the neighborhood last month to shoot a few scenes in this restaurant. Voila, my places to go. Quelle tristesse! moi j'adorais aller à la squadra, c'était la cantine de la bande! Thanks as always for your comments, Jeff! La Sieste, desolé que tu as perdu ta cantine si on parle de la meme pizzeria… Il reste encore 109 pizzerias dans la ville! That's a beautiful part of town (and wonderful photos btw). Thanks for the tips. I'm going to definitely check some of those little restaurants out. Sorry, I thaught you were french! Well, maybe we meet sometime at the Voxx, not even knowing that we both are food bloggers! Thank you for all the information on your neighborhood......appears to be a great place to live! So much good information! Of all things, I just found you on the blogger help forum ... I'm glad I did and I will definitely be back again! misschrisc, jann, la sieste, pj, and francine - thank you all for the great comments! It's nice to see you here. I will keep those in mind next time I am in Lyon! What a lovely neighborhood you live in! I have never lived in a city and envy you being able to walk to so many wonderful places. I am embarrassed to admit that we have not spent any time in Lyon but we do hope to remedy that this winter - once the garden allows me to leave. Thanks for the wonderdul tips! Your photos are wonderful, Lucy! I am getting a real feel for your neighborhood.